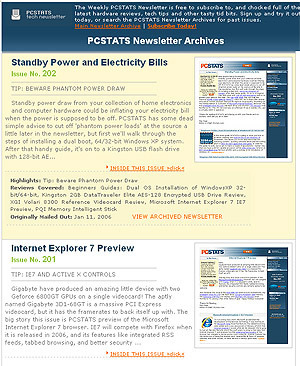 PCstats.com Newsletter - PCstats.com PCSTATS - PC Hardware Reviews and Guides - Get The 'Stats and Stay Informed! Past Issues of the Weekly PCSTATS Newsletters are now Archived and Online! The archives go back over 4 years, so if there has ever been a Weekly TechTip you've wanted to double check, a Reader Q&A that was extra helpful, a special report, or maybe just that one article which we highlighted - the PCSTATS Newsletter Archives will have it. There are over 200 issues archived right now, and more will be added shortly. Please take a moment to walk though the index of past PCSTATS Newsletters. Of course, to get the latest PCSTATS Newsletter you will have to be a subscriber, it takes a few seconds to authorize us to send you the newsletter, so if you'd like to give it a try sign up right here. If you don't like what you see, just unsubscribe. It's a simple as that, and unlike SPAM our unsubscribe link works instantly, and well... actually works. The PCSTATS Newsletter - it's free, it's informative and it arrives in your mailbox weekly.